Red banana is a variety of bananas having reddish purple skin. In Australia, these bananas are also known as red Dacca bananas. They have similar nutritional value and rich in potassium, as yellow bananas have. Red bananas are sweeter than yellow bananas and having a flavor of raspberry. Red bananas are smaller and flesh color varies from cream to light pink. They are also plumper and softer than common Cavendish banana. 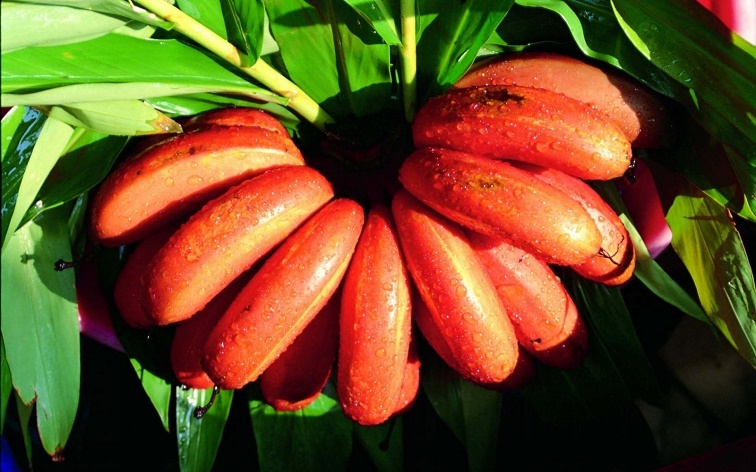 Red bananas are cultivated in Asia, East Africa and South America. Red bananas are having similar nutritional value as yellow bananas have, but the difference is about the carotene and vitamin C content. Red Bananas are rich in carotene and vitamin C as compared to yellow banana. It is due to the red color of banana. However, the red banana peel has more carotene content than its flesh. Red bananas are favorite fruits in the Central America due to its taste, as they are sweeter than bananas and have raspberry flavor. Red bananas have similar health benefits as yellow bananas have. You can include red bananas in your daily diet to keep your digestive system healthy and to get a proper nutrition. Red bananas are low in calories and low in glycemic index, so they are best fruits that you can include in your weight loss diet plan. They also feel you full abdomen and no appetite for a several hours without giving you more calories. Therefore, you can overcome food cravings and control your appetite. They are best fruits for weight loss and they provide a good nutrition too. One medium red banana can provide you about 3 to 4 grams of dietary fiber, which keeps your digestive health perfect and helps in constipation too. A single banana can give you about 15% of daily fiber needs. Due to the fiber and potassium content, red banana helps in reducing the risks of heart diseases and other metabolic diseases including diabetes. A medium red banana provides about 400 mg of potassium, which is equal to 11% of daily requirement of potassium. You need potassium for heart health, as it maintains the electrolyte and fluids balance in the body. In addition, potassium plays a vital role in heart muscle functions. It is required for heart contraction that pulls the blood to the various parts of the body. Potassium rich foods also lower blood pressure, so you can also get benefits from red banana in high blood pressure. Red bananas are a good source of iron and Vitamin B6. These nutrients are essential for red blood cell metabolism and making hemoglobin. 100 grams of red banana pulp provides 0.4 mg vitamin B6 and 0.3 mg iron. Red bananas are rich in vitamin C. A medium banana contains about 10 mg vitamin C, which is equal to 17% of daily value of vitamin C.
In addition, red banana contains a colorful substance, which helps in boosting immunity and preventing cancer. Red bananas are rich in antioxidants and fights off free radicals, which further reduce the risks of cancer and heart diseases. Red bananas can also help in reducing and treating various diseases, let us discuss about them. Take 20 grams honey and 300 grams of red banana pulp. Mix banana pulp with honey and eat once a day on empty stomach daily for 15 days. It will help to treat and prevent angina pectoris. Are you suffering from frequent urination and do you wake up many times in night for urination? In this condition, red bananas can help. Take 100 grams red banana pulp, amla juice and brown sugar. Mix these three ingredients and eat twice a day. It will help you to control frequent urination. You should take this remedy for at least 10 days. Red bananas are also helpful in acidity and ulcer. You can eat a medium red banana and then take a half teaspoon of Licorice (Mulethi or Yashtimadhu) with water. This helps you to get rid of acidity and ulcer. Eating red bananas and then taking milk adding a teaspoon of honey helps in leucorrhea. Many children and pregnant women eat clay or soil. This problem is known as pica. Red bananas can help you to get rid of this problem. You can eat red banana pulp mixing with honey. You can also eat a banana and then drink a glass of water adding one teaspoon of honey in it. Red bananas are good food for children suffering with malnutrition. Its nutritional content and high caloric value provide sufficient energy and nutrition to children with malnutrition. However, some children with malnutrition also have digestive problems and may have trouble in digesting the foods. Therefore, sprinkling black pepper and black salt on the red banana helps improving digestion and improves overall health. Red bananas are safe in pregnancy. Red bananas improve overall health of pregnant and lactating women due to its nutritional content. It is nutritious fruit. A medium red banana contains 110 calories and good amount of vitamin C and B6. Who should not eat red bananas? Patients with kidney diseases or kidney failure and with potassium diet restriction should not eat red bananas. I am very thankful to you. I have tried your red banana remedy for chest pain. I got relief from it. I had used it for 2 months and now I have not a single attack of angina pain since last three months. I think we can also use it for a longer period, as this is a food, not a medicine. Unique information about red banana and we want to use it, unfortunately, it is not available in India. Can we use simple (yellow) banana for angina pain with same remedial proportion, as in your article. Will it work? Thank you for your feedback. Yellow banana will also work in angina pain. You can use above remedy for angina as food supplement.